Guests looking for a truly unique experience should consider staying at the Fort Wilderness Campgrounds. While roughing it may not seem like everyone’s idea of a good time while on vacation, there is much to love about this underrated resort. 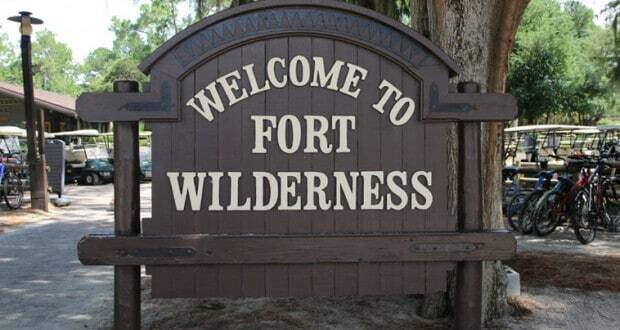 Here are the seven reasons why you’ll love staying at Fort Wilderness! 7 – Variety of “Rooms” – guests have a variety of options when it comes to staying at Fort Wilderness for their “rooms.” Guests who have an RV or want to rent one, can rent a campsite that comes with sewer, power, and cable hook-ups. Guests looking for a more traditional resort experience can rent one of the cabins at Fort Wilderness that offer traditional camping options with bunk beds, a kitchenette, and a living space. Guests who truly want to rough it can do so at one of the primitive camping sites. No worries when it comes to bathroom facilities, comfort stations are available throughout the resort to all guests. 6 – Unique Activities – while at Fort Wilderness, guests have the ability to take advantage of a whole host of unique activities. Guests can take in the nightly campfire sing-a-long with Chip and Dale, choose to play tennis or tetherball, take a horseback ride, or enjoy a nighttime carriage ride around the property. Regardless of your interest, guests will find something new to see and do on a visit to Fort Wilderness! 5 – Boat Transportation – since Fort Wilderness is located on Bay Lake, it is very close to the Magic Kingdom. Guests staying at the resort can take boat transportation to the Magic Kingdom, but also to the Contemporary Resort to link up with the monorail and get to any of the other Magic Kingdom resorts and even Epcot. We love having alternative methods of transportation as opposed to just a bus and having the option is a great perk of the resort! 4 – Themed Dining Experiences – when it comes to a special dining experience, Fort Wilderness boasts TWO options for guests. Guests can take advantage of Mickey’s Backyard BBQ which offers traditional backyard barbecue options with a selection of ribs, chicken, hot dogs, hamburgers, and all the fixings. Guests of age can also find all-you-care-to-enjoy wine and beer. The other experience at Fort Wilderness is the Hoop Dee Doo Musical Revue which offers similar food and drink offerings, but also an amazingly comical dinner show! Both experiences require pre-payment, so if you are interested in either of these, make sure to make your reservation as soon as possible! 3 – Shopping Options – throughout the resort are various shopping outposts for guests to find a variety of unique souvenirs tied to the rustic theme of the resort, as well as a variety of snacks and drinks for guests looking to stay in their cabin or RV sites for the night. 2 – Delicious (and Cheap) Eats – the traditional restaurant at Fort Wilderness is Trail’s End which is open to serve guests for breakfast, lunch, and dinner. All meals are served buffet-style, so guests can help themselves to whatever they want and to as much as they’d like to enjoy. The meals are very cheap compared to other buffets that Disney has on property and also offer some inventive cocktails – on a recent trip, my father-in-law and I had a delicious blackberry moonshine cocktail! They accept the Tables in Wonderland discount card which makes this dining option even more appealing! 1 – Budget Conscious – the cost of a campsite at Fort Wilderness is very competitive when compared to an actual resort room and when you factor in all of the additional experiences, as well as the overall theme of the resort, this could be a great choice for families who are looking for a unique vacation experience, as well as those who are attempting to extend their vacations a few days longer without added expense! We loved our first stay at Fort Wilderness – so much so that we have another three stays already scheduled in the next six months. We love the uniqueness of the experience, but also enjoy the definite Disney flourishes that the resort offers, as well. Have you stayed at Fort Wilderness? What do you love about it?